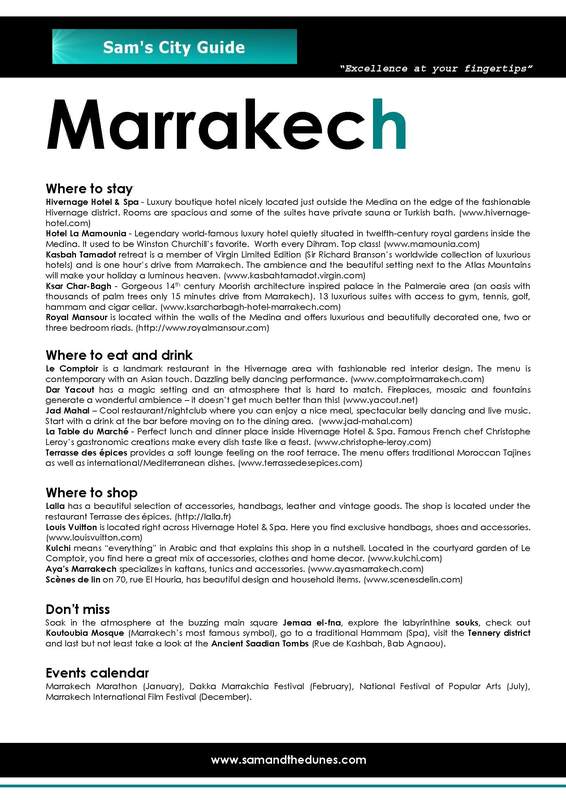 Posted on January 30, 2013, in Travel tips and tagged City Guide, free, Marrakech, pdf, Sam's City Guide, travel. Bookmark the permalink. 4 Comments. Oh my GOSH. I want to go so badly. Marrakech is on our Grand World Tour and I can’t wait! So nice – I’ll definitely check out the guide when I come to Marrakesh – thanks for putting it together. My wife and I almost came there this year but she got accepted to nursing school so we put the trip on hold. Looks amazing! Many thanks for your comment! We are planning to do more city guides and hopefully we can share them here soon. Hope you get a chance to visit Marrakesh at one point – it’s a beautiful place!